OLD SPORT is a Huckins 44 Atlantic in exceptional condition after a near-complete refit completed in 2017 at Hinckley Yachts. She features factory-remanufactured engines, new electronics and systems, and an Awlgrip painted hull faired by longboard. 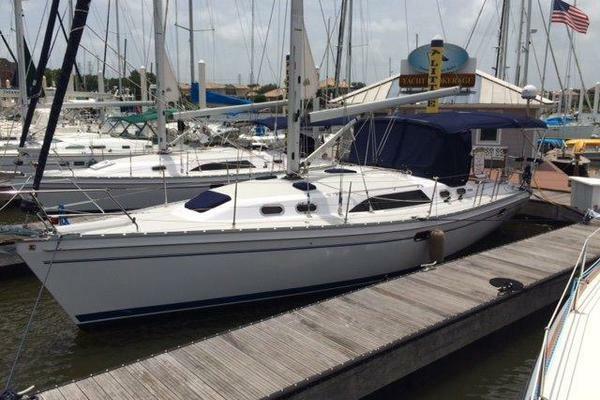 She presents an excellent opportunity for a like-new Huckins without the wait. Easily shown in Annapolis, MD. The 44 Atlantic follows in the footsteps of the classic Huckins design and combines it with modern materials and performance. Few boats can compare with her grace and elegance, let alone her performance underway thanks to her Quadraconic hull providing a fast, smooth, and exceptionally stable ride. Easily traversed side decks, sweeping sheer, tumblehome aft create an elegant yet classic yacht with proportions that look “just right”. Ideally suited for a couple who enjoy entertaining as much as spending time alone, OLD SPORT features a spacious and open layout and large living spaces in both the partially enclosed pilothouse and window-filled main salon. 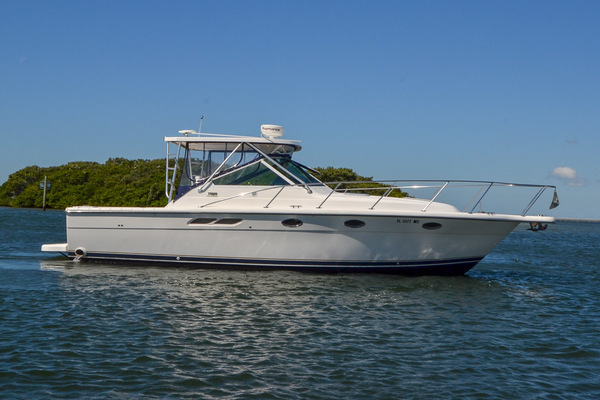 Her extended covered pilothouse features a custom roll-up enclosure and reverse-cycle air-conditioning with heat invite the outdoors in but provide protection from the elements when needed. A beautiful wooden spoke Huckins steering wheel and custom stainless “engine turned” instrument panel complete the stately helm station, and the entire pilothouse is freshly painted and has easy-to-clean snap down carpeting. A “lunch hook” deployed off the stern fills the boat with a gentle breeze. Yacht Interiors of Annapolis decorated her main salon with custom venetian blinds, the finest upholstery, carpet, and curtains, a Nancy Hammond Print, and custom faux snake skin swivel seats with storage underneath (owner was a fighter pilot- call sign “Snake”) opposite a large and comfortable settee. A queen island-style berth anchors the master suite, and the adjacent spacious head features with Corian counters and a separate shower. Her large galley with two drawer-style refrigerators is perfect for creating anything from light appetizers to gourmet dinners. From 2015-2017 OLD SPORT underwent an extensive refit where Hinckley Yacht Services upgraded, modified, or replaced almost every system at the direction of a highly experienced yachtsman of the “Old School” with an open checkbook. She feels like a nearly new vessel and is truly turnkey. Her hull, deck, pilothouse interior, and aft cockpit received new paint, hull sides faired by longboard, and her bottom was soda blasted, faired and painted. She received factory remanufactured Cummins 370-hp engines, bow and stern thrusters with handheld remote, new Furuno electronics suite includes two 15” multi-function displays and mast-mounted camera for assistance spotting the errant crab pot or paddle boarder. Hinckley Yacht Services looks after OLD SPORT and she is stored in a heated hanger every winter. The hull, deck and superstructure are E-glass with vinylester resin over closed cell foam core. The Pilothouse is the primary outdoor living and entertaining space and incorporates the helm forward to starboard, a raised forward facing settee forward to port, a wet bar and open seating to starboard and an L-shaped settee to port accented by a custom drop-leaf cocktail table. Each settee features light grey upholstery with blue piping and extensive and easily accessible storage below. The pilothouse features air conditioning and reverse-cycle heat, and roll-up drop curtains an either open the space or completely protect it from the elements. An extended hard top and electrically opening windows complete the space. Aft of the pilothouse is the aft deck, which serves as entry to the pilothouse up two steps. The open deck features a custom transom door added during the refit, and provides easy access to rope lockers and the Glendinning shore power cable. Two steps down from the pilothouse through the companionway hatch is the spacious Main Salon. The full-size Galley is forward to port, and forward to starboard is the head with separate shower. Further forward and through a solid door is the master stateroom. The interior features a Hereshoff-style interior finished in white wall coverings accented by satin finished American cherry. Forward of the galley and head through a centerline door is the master stateroom. The island queen bed is flanked by cedar lined hanging lockers and numerous drawers and storage compartments. The flat screen TV is to starboard and the overhead hatch provides copious light and ventilation. Lighting is by dimmable overhead fixtures and wall sconces forward. The spacious galley is located forward to port and down two steps, creating a very functional space for creating anything from light appetizers to gourmet dinners. Two drawer-style U-Line refrigerators provide plenty of space for food and beverages. Ample counter and storage space add to the functionality. A large window outboard provides ample light, and an opening hatch overhead space offers ventilation. Adjacent to starboard from the galley is the spacious head. It features a wide vanity with sink and separate shower. Three steps down through the pilothouse companionway is the main salon. It is open, airy, and has tremendous natural light thanks to near continuous windows on the port and starboard sides. Two swivel chairs and a writing desk with flatscreen TV mounted on top are to port. Lockers and the main electrical panel are outboard to port. To starboard is an L-shaped settee with cocktail table, with end table on the forward end. Storage provided by many built in compartments. The engine room is directly below the pilothouse and features near standing headroom and tremendous access outboard of the engines. A custom aluminum ladder provides easy access. The generator is located at the aft end of the engine room on centerline. A separate lazarette is further aft and separated by a watertight bulkhead. Varnished bow pulpit with Lewmar windlass, 25# Lewmar stainless steel delta anchor, 20' chain and 200' of 1/2" nylon rode. Bow anchor has never been used. Stainless bow roller, windlass controls on foredeck and at helm station. Medium and light “lunch-hook” stern anchors and with custom bridle. Bow and stern anchor raw water washdowns.